Has it really and truly been three months since we began our little Thursday party? Well, it surely doesn't seem that long to all of us. have gotten us all through those transition months from Winter to Spring. 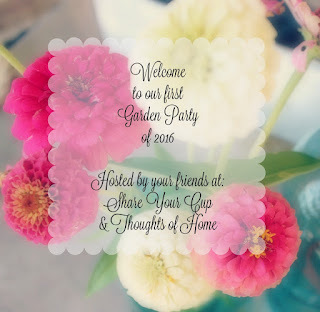 We are all in awe of what you are sharing at the garden party too! Truly, your creativity is over the top gorgeous. 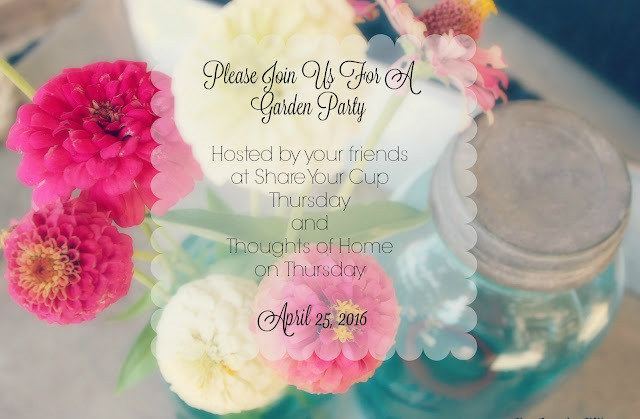 please continue to share as your garden's bloom and thrive. 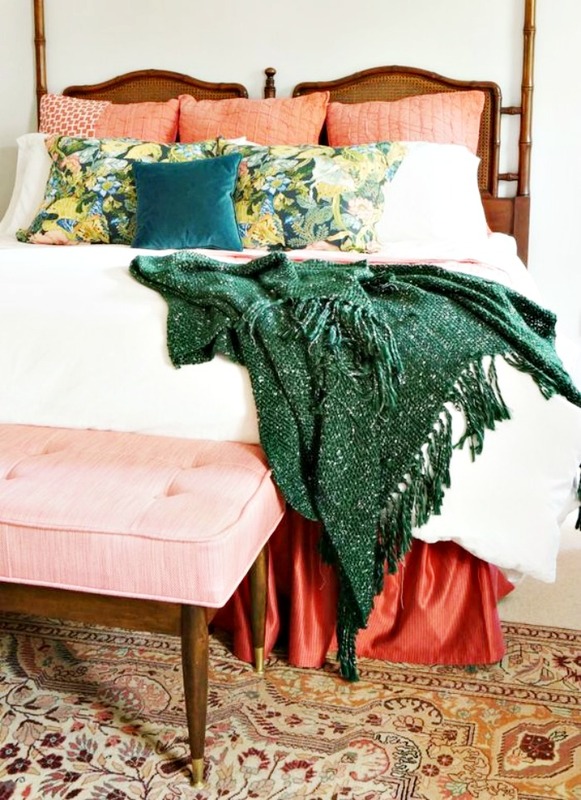 One Room Challenge, how did she do it you may ask? With Rit dye! 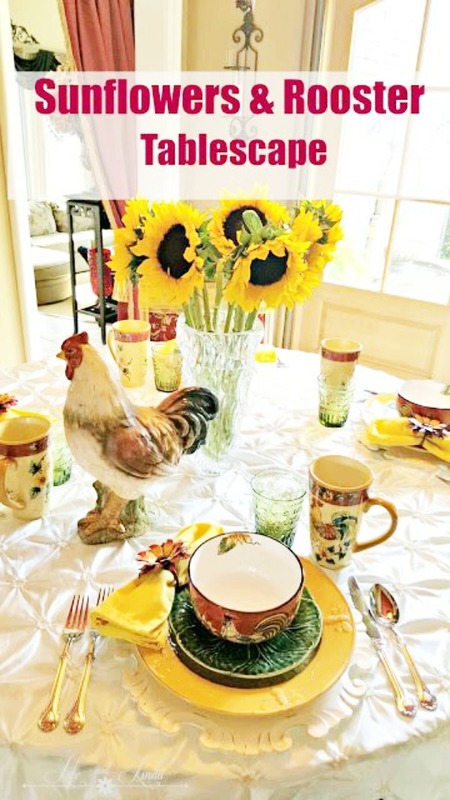 Joan always creates magic in her kitchen and shares step-by-step tutorials too. 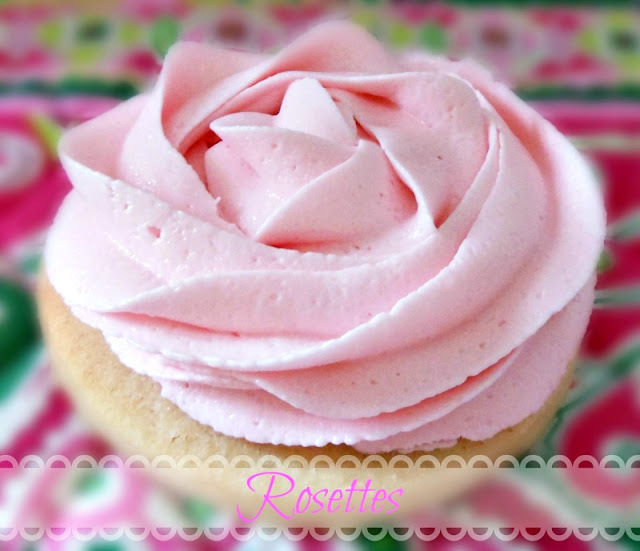 Wouldn't these cookies be perfect for a shower or Mother's Day. Ron shares his love of gardening that graces his charming Southern home. Robin transforms new bargain buckets from the dollar section at Target. Great tutorial included for this project. 1. Link back to this post and follow any one of the four hostesses at these blogs. 2. Share any of your favorite posts remembering not to link to advertising or shops. We like to think of this as a very special gathering where thoughtfulness reigns. to the Kleberg County Farmers Co-op gin in Ricardo, Texas. I wonder if he knew that morning that his cotton would produce the first bale of the season? That young man was my father. I so enjoy knowing deep down in my heart that I am a farmer’s daughter. I too have some of my own season firsts happening right now in my yard. These are my first zinnia blooms of the season , and these are my tomatoes. I am going to have my first one of these for the season. Welcome to my Esperanza Garden, one of my favorite places in our backyard. Let’s have a glass of iced tea with lime South Texas style, a few empanaditas de cajeta, and some fruit and talk about our love of gardening. hope that it will rain, hope that everything we have planted can withstand the hot South Texas sun, and hope that our plants will grow. It’s also a place where I can display some of my favorite pieces of talavera pottery. Long ago I decided that I would treat outdoor garden rooms as indoor rooms, and then it all made sense. There are places to sit everywhere and things to see. And now it’s time to hear your gardening story. Welcome to Thoughts of Home on Thursday #11. Our hostess this week is Laura of White Spray Paint. hosted by the ladies of Thoughts of Home on Thursday and Share your Cup Thursday. 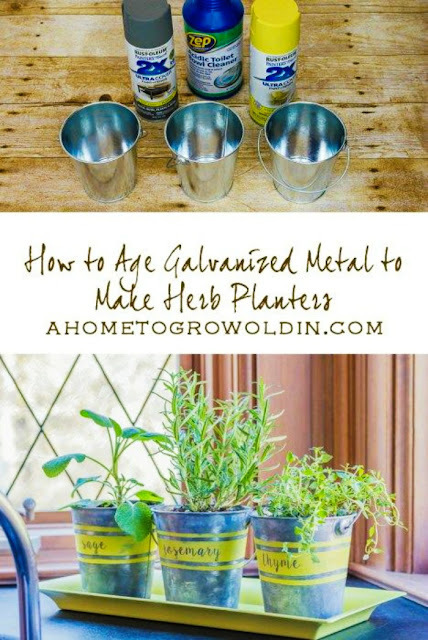 We can’t wait to see what is happening in your garden this spring! And now to this week’s features. Of Mollie’s Mom wows with her One Room Challenge design board. and gives chemist tips about the recipe as well. 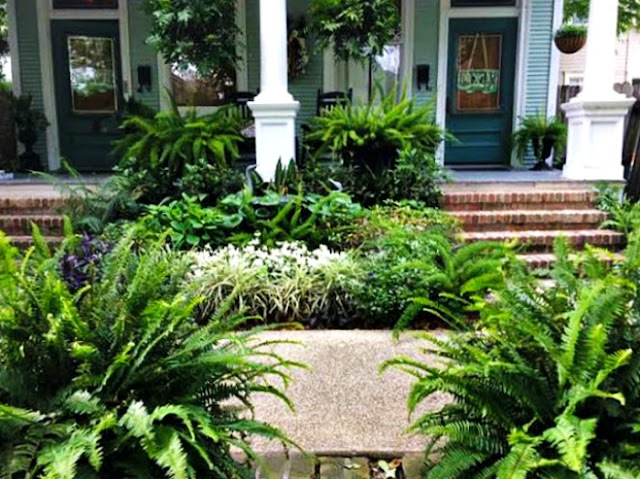 Rita of Panoply tackled her garden chores and transformed areas of her beautiful yard. Altered Artworks completes a vintage poolside chair makeover that gives it an all new look. read Katie of Preppy Empty Nester’s description of a family tour of Hahvahd! 1. Link back to this post and follow any of the four hostesses at these blogs. 2. Share any of your favorite posts, remembering not to link to advertising or shops. My father’s zinnia seeds I saved and planted in February 2016 are growing! This band of zinnia planting sisters came to my side last fall when my father passed away. I shared them with these wonderful women. listen, and I encouraged starting a zinnia garden. It was all because of him. And now for the update. I have 3 raised beds and things have taken a great growth spurt. And finally, my friend JB’s zinnias, sprouting from last year’s seeds- just like Papa’s did year after year. All women need a sisterhood and gardening is the best common ground for that. I am so grateful for mine. started out as something else. and because I live in South Texas. Why does living in South Texas have anything to do with anything? and pottery which is predominant where I live. I will show you what I mean someday soon . These colors working together , as I shared here, are old friends. In fact, so were the guests! Warning: This is a thought teaser. You may experience this in life. on a work project, or you made special plans. It may seem to you on that special day that no one noticed what you had done. What made you feel that way? Maybe no one commented . And that is where the lesson lives. It is not about what others say . So if that is the lesson, what is the moral? This may not make sense. 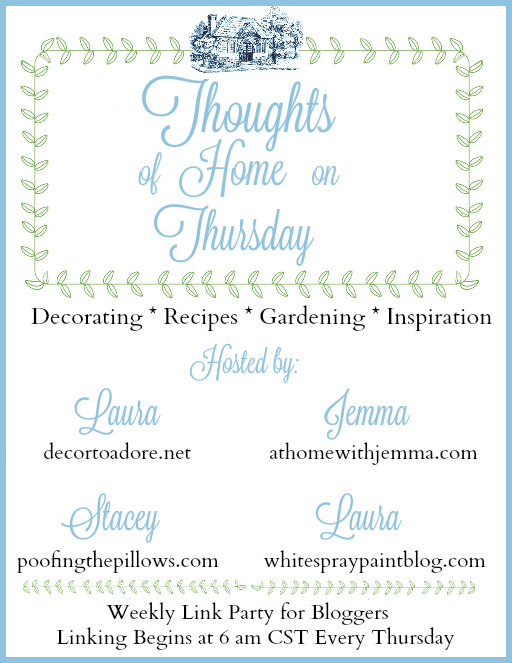 Good morning and welcome friends to Thoughts of Home on Thursday #10. We have had ten weeks of you sharing your amazing creativity and inspiring us more than you could know. Stacey of Poofing the Pillows is our hostess this week. She's busy working outside getting ready for a garden party. We hope you'll mark your calendars and join us. 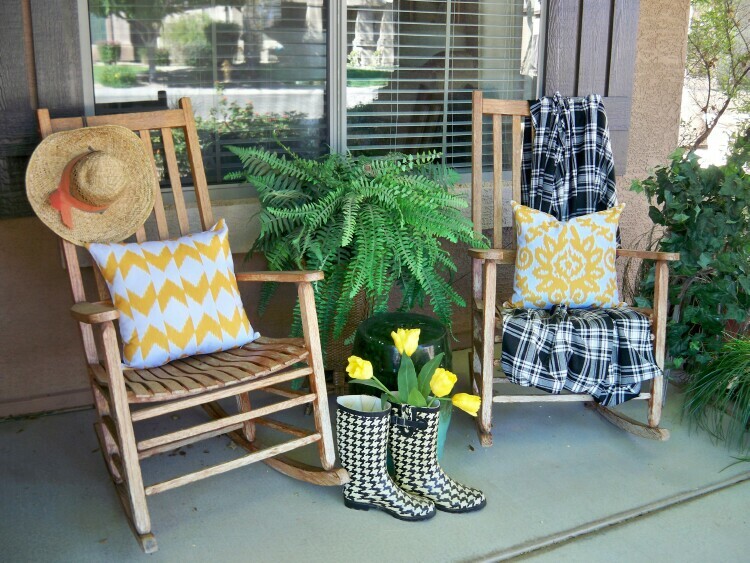 Marty at A Stroll Thru Life showed her front porch all spiffed up for spring. Her decorative touches are definitely welcoming. 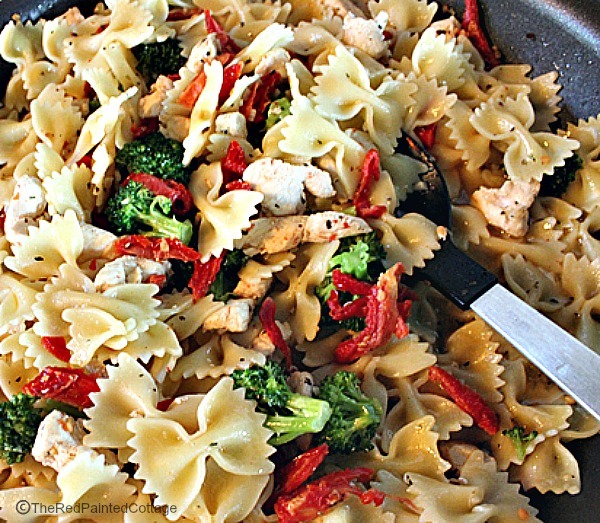 Carol at The Red Painted Cottage shared a Bow-Tie Pasta with Chicken and Broccoli that could probably be on regular rotation all summer. 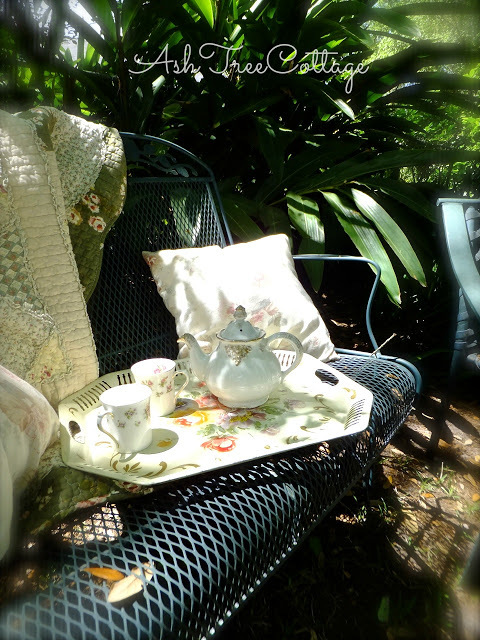 Susan at Ash Tree Cottage shared Garden Niches that beckon you to grab a glass of iced tea and stroll the yard. 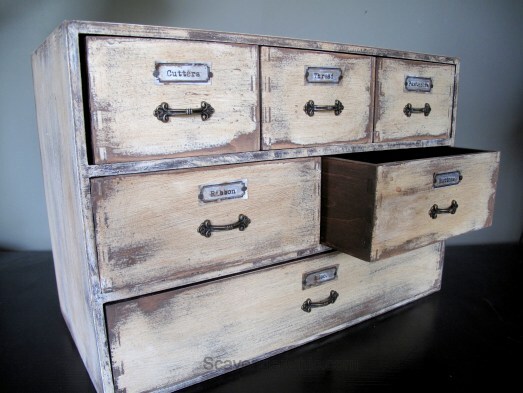 Joan at Scavenger Chic completely transformed a set of wooden drawers from Ikea into an antique looking storage cabinet. Mimi at 247 Mulberry Lane took us on a drive with her to see the sights where she lives. 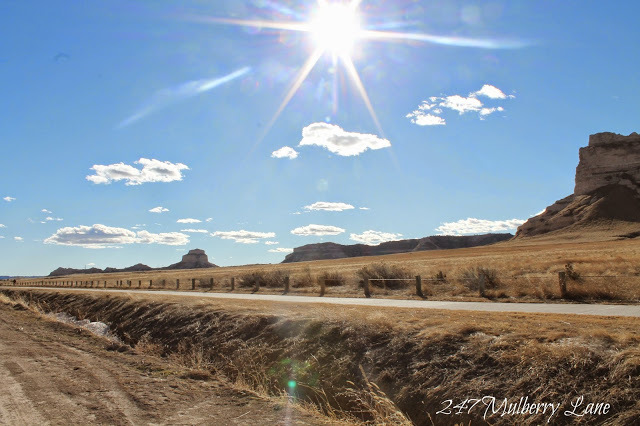 Even if you aren't a road trip family, these pictures might make you grab a map and plot out a trip!